We aspire to be the “go-to” provider of innovative solutions for global partners combating poverty. We have some exciting new products we’re looking to develop over the coming years. Future Innovations from Design Outreach on Vimeo. Self-closing valves are found all around the world. They are in public restrooms and on drinking fountains at parks and schools, and on clean water pipelines in rural communities in developing countries. In these remote locations, the self-closing valves currently available are not durable enough to withstand the heavy daily use they are subjected to. In many cases, self-closing valves leak during use, allowing clean water to run over the user’s hands and into their buckets, contaminating the water. While self-closing valves are critical components in many rural water systems, the designs available today are not robust enough to meet user needs, prevent illness, and conserve water. 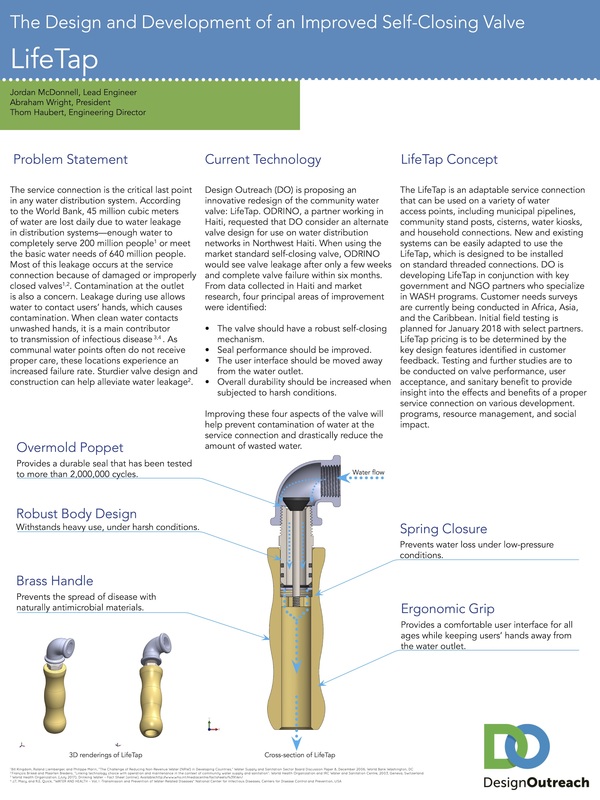 Design Outreach developed a market-ready self-closing valve designed to overcome these challenges. DO is accomplishing this by focusing on human-centered design and by researching how the valves are used in various countries around the world. The goal is to create a solution that is safe, sanitary, and appropriate for the communities we will serve. The self-closing valve project is currently in the development stage. Many villages rely on the Village-Level Operation & Maintenance (VLOM) model in caring for their water wells. In these villages, the local people are responsible for the upkeep and all associated costs of their pump. This can mean the choice between buying food for their children or putting money toward repairing the well. Design Outreach is seeking to solve this problem through LifePump and through the New Repair Kit project. This project will extend the life cycle of two of the most common hand pumps used today: the India Mark II and the Afridev. Our hope with this project is to help minimize the cost of hand pump repair until a LifePump can be installed. The repair kit project is currently in the research phase. The first permanent LifePump, installed in Zolomondo, Malawi, has been operating for more than three years. LifePump operates at depths of 100 meters. After seeing the success of our 100-meter pump, we asked ourselves, “Why should 100 meters be the maximum depth of a hand pump?” That is when we started developing the 150-meter version of LifePump—that is a staggering 500 feet, a depth that is unheard of in the hand-powered water pump community. The first LifePump150 was installed in the community of Moulin, Haiti in June of 2018.